Wondering how the 4″ display works? 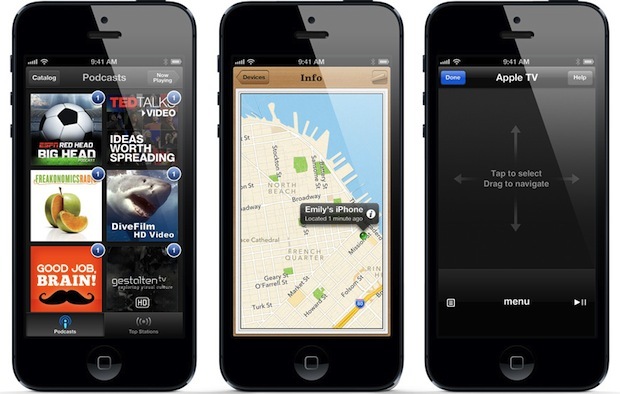 For starters, iPhone 5 displays a 5th row of icons on the home screen, in addition to the standard Dock. Because of the larger display, old apps will run in letterbox mode centered on screen until they are adjusted to be native, but many apps are already updated to run on the 4″ display. Pre-orders start September 14 for a September 21 release date. Pricing starts at $199 for the 16GB model, with two-year contract. @Adam The Motoral Droid RAZR has a bump (for antennas ?) that is about 11mm big. The 7.1mm only accounts for the rest of the body. ‘iPhone 5’? God dammit Apple. Well, it at least better not be on the box…. whatever, I’m buying one. « Pre-Orders for iPhone 5 to Start Friday, September 14?